Bruges ( /ˈbruːʒ/ in English; Dutch: Brugge [ˈbrʏɣə]; French: Bruges [bʁyːʒ]; German: Brügge [ˈbrʏɡə]) is the capital and largest city of the province of West Flanders in the Flemish Region of Belgium, in the northwest of the country. 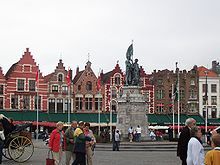 The area of the whole city amounts to more than 13,840 hectares, including 1,075 hectares off the coast, at Zeebrugge (from Brugge aan zee meaning "Bruges on Sea"). The historic city centre is a prominent World Heritage Site of UNESCO. It is oval-shaped and about 430 hectares in size. The city's total population is 117,073 (1 January 2008), of whom around 20,000 live in the city centre. The metropolitan area, including the outer commuter zone, covers an area of 616 km2 (238 sq mi) and has a total of 255,844 inhabitants as of 1 January 2008. Along with a few other canal-based northern cities, such as Amsterdam and Stockholm, it is sometimes referred to as The Venice of the North. Bruges has a significant economic importance thanks to its port and was once the chief commercial city in the world. The name probably derives from the Old Dutch for "bridge"; cf. Middle Dutch brucge, brugge (or brugghe, brigghe, bregghe, brogghe), and modern Dutch bruggehoofd ("bridgehead") and Brug ("bridge"). The form brugghe would be a southern Dutch variant. The Dutch word and the English "bridge" both derive from Proto-Germanic *brugjō-. Bruges was a portal to The Amber Road, a trade route to the East that began in 1600 BC. Very few traces of human activity in Bruges date from the Pre-Roman Gaul era. The first fortifications were built after Julius Caesar's conquest of the Menapii in the first century BC, to protect the coastal area against pirates. The Franks took over the whole region from the Gallo-Romans around the 4th century and administered it as the Pagus Flandrensis. The Viking incursions of the ninth century prompted Baldwin I, Count of Flanders to reinforce the Roman fortifications; trade soon resumed with England and Scandinavia. With the reawakening of town life in the twelfth century, a wool market, a woollens weaving industry, and the market for cloth all profited from the shelter of city walls, where surpluses could be safely accumulated under the patronage of the counts of Flanders. The city's entrepreneurs reached out to make economic colonies of England and Scotland's wool-producing districts. English contacts brought Normandy grain and Gascon wines. 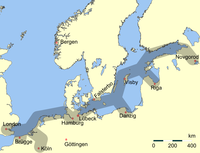 Hanseatic ships filled the harbor, which had to be expanded beyond Damme to Sluys to accommodate the new cog-ships. In 1277, the first merchant fleet from Genoa appeared in the port of Bruges, first of the merchant colony that made Bruges the main link to the trade of the Mediterranean. This development opened not only the trade in spices from the Levant, but also advanced commercial and financial techniques and a flood of capital that soon took over the banking of Bruges. The Bourse opened in 1309 (most likely the first stock exchange in the world) and developed into the most sophisticated money market of the Low Countries in the 14th century. By the time Venetian galleys first appeared, in 1314, they were latecomers. Numerous foreign merchants were welcomed in Bruges, such as the Castilian wool merchants who first arrived in the 13th century. The foreign merchants expanded the city's trading zones. They maintained separate communities governed by their own laws until the economic collapse after 1700. The Belfry – situated on the south side of the Markt. Bastogne, Luxembourg, Belgium : After World War II and into the 1970s, Bruges, more specifically the Fire Brigade of Bruges, entertained friendly relations with Bastogne. Each year a free holiday was offered at the seaside in Zeebrugge, to children from the Nuts city. Arolsen, Hesse, Germany : From the 1950s until the 1980s, Bruges was the patron of the Belgian First Regiment of Horse Guards, quartered in Arolsen. Salamanca, Castilla y León, Spain : Both towns having been made European Capital of Culture in 2002, Bruges had some exchanges organized with Salamanca. Mons, Hainaut, Belgium : In 2007, cultural and artistic cooperation between Mons and Bruges was inaugurated. Burgos, Castilla y León, Spain : On 29 January 2007, the mayors of Burgos and Bruges signed a declaration of intent about future cooperation on cultural, touristic and economic matters. ^ Statistics Belgium; Population de droit par commune au 1 janvier 2008 (excel-file) Population of all municipalities in Belgium, as of 1 January 2008. Retrieved on 19 October 2008. ^ Statistics Belgium; De Belgische Stadsgewesten 2001 (pdf-file) Definitions of metropolitan areas in Belgium. The metropolitan area of Bruges is divided into three levels. First, the central agglomeration (agglomeratie), which in this case is Bruges municipality, with 117,073 inhabitants (1 January 2008). Adding the closest surroundings (banlieue) gives a total of 166,502. And, including the outer commuter zone (forensenwoonzone) the population is 255,844. Retrieved on 2008-10-19. ^ (2005) "Grandeur, Decadence and Renaissance". Journal of Coastal Research: 425–447. , quote: "Rise, fall and resurrection make up the life story of Bruges, a city that glittered in Northern Europe with as much panache as Venice did in the Mediterranean World." ^ "etymologiebank.nl". etymologiebank.nl. 5 April 1922. http://etymologiebank.nl/trefwoord/brug. Retrieved 20 February 2014. ^ William Morris, ed (1969). "Appendix, "Indo-European Roots"". American Heritage Dictionary of the English Language. American Heritage Publishing Co.. p. 1510. ^ a b (2005) "Charlier, Roger H. "Grandeur, Decadence and Renaissance". Journal of Coastal Research: 425–447. ^ a b (2010) "The Zwin: From Golden Inlet to Nature Reserve". Journal of Coastal Research 27 (4). ^ Mack Ott (2012). The Political Economy of Nation Building: The World's Unfinished Business. Transaction Publishers. p. 92. https://books.google.com/books?id=YJyRLypfagYC&pg=PA92. ^ James Donald Tracy (1993). The Rise of Merchant Empires: Long-Distance Trade in the Early Modern World, 1350-1750. Cambridge U.P.. p. 263. https://books.google.com/books?id=heEdZziizrUC&pg=PA263. ^ Spruyt, H. (1996). The Sovereign State and Its Competitors: An Analysis of Systems Change. Princeton University Press. p. 88. ISBN 9780691029108. http://books.google.dk/books?id=Jx2Q4hxT5HAC. Retrieved 13 March 2015. ^ David Plant (10 September 2007). "Charles, Prince of Wales, (later Charles II), 1630-85". British-civil-wars.co.uk. http://www.british-civil-wars.co.uk/biog/charles2.htm. Retrieved 7 July 2009. ^ Andre de Vries (2007). Flanders:A Cultural History: A Cultural History. Oxford U.P.. p. 143. https://books.google.com/books?id=QvSovOY_VV0C&pg=PA143. ^ Stephen V. (Stephen Victor) Ward (1998). Selling Places: The Marketing and Promotion of Towns and Cities, 1850-2000. Spon. p. 40. https://books.google.com/books?id=P9L6GgYgEAIC&pg=PA40. ^ Jack E. Boucher, "Bruges, Belgium", American Preservation (1978) 2#1 pp 30-39. ^ "Historic Centre of Brugge – UNESCO World Heritage Centre". Whc.unesco.org. http://whc.unesco.org/en/list/996. Retrieved 20 February 2014. ^ "Diamond Museum". Diamond Museum. http://www.diamondmuseum.be/website/page.asp?lang=en&Pag=10&pnav=;26;. Retrieved 20 January 2014. ^ "The Merchant Shipping Act : mv Herald of Free Enterprise : Formal Investigation". Maib.gov.uk. http://www.maib.gov.uk/cms_resources.cfm?file=/HofFEfinal.pdf. Retrieved 20 February 2014. ^ "Blog Archive » Saint Andrew the Apostle". Saints. SQPN.com. 11 February 2014. http://saints.sqpn.com/saint-andrew-the-apostle/. Retrieved 20 February 2014. ^ "Brugse Straffe Hendrik valt in de smaak bij Amerikaanse acti... (Brugge) - Het Nieuwsblad". nieuwsblad.be. http://www.nieuwsblad.be/cnt/dmf20141029_01348952. Retrieved 13 March 2015. "Bruges". Encyclopaedia Britannica. 4 (9th ed.). 1878. This page uses content from the English language Wikipedia. The original content was at Bruges. The list of authors can be seen in the page history. As with this Familypedia wiki, the content of Wikipedia is available under the Creative Commons License.